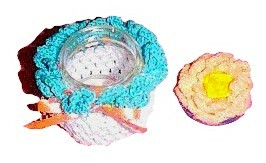 A small amount of leftover yarn and a baby food jar are recycled into a small trinket jar in this free crochet project. This would also make a nice presentation jar for smelly jelly air fresheners or a survival kit. Rnd 2: Ch 3, dc in same st, 2 dc in each at around, join as before. Rnd 3: Ch 3, dc in same st, 2 dc in next st, dc in each of next 2 sts, around, join. Rnd 4: Ch 3, dc in next st, 2 dc in next st dc in each of the next 2 sts, join. Rnd 5: Working this rnd in back lps, for beginning popcorn(beg pc), ch 3, 3 dc in same st, drop lp from hook, insert hook in 3rd ch of ch 3, pull dropped lp through ch, ch 1, skip next st,* for popcorn (pc), 4 dc in next st, drop lp from hook, insert hook in top of first dc of tgroup, pull dropped lp through st, ch 1, skip next st, repeat from * around, join with sl st in top of first pc. Rnd 6-9: sl st, beg pc, in next ch 1 sp, ch 1, skip next st, pc in next ch 1, skip next st, around, join as before. At end of last rnd, fasten off. Rnd 11: ch 1, *(sc, ch 1, dc, 3 tr, 4 dtr) in next ch sp, ch 3, sl st in 3rd ch from hook,(4 dtr, 3 tr, dc,ch 1, sc)in next ch sp, repeat from* around, join with sl st in first sc, fasten off. Weave peach ribbon through rnd 10, tie ends in a bow. Rnd 4: Working in front of petals in skipped st of rnd 1, sl st in each of the next 2 hdc, ch 7, sl st in center st of next 3 skipped sts, ch 7, around, join with sl st in first ch of first ch 7. Rnd 5: ch 1, sc, 2 dc,8 tr,2 dc, sc in each ch sp around, join as before. Rnd 6: Working in skipped sts of rnd1,ch 1, sl st in next st ch7,skip next st, sl st in next st, ch 7, around, join as before. Rnd 8: Working in skipped sts of rnd 1, ch 1, sl st in next st, ch 5, sl st in next st, ch 5, around, join with sl st in first ch of ch 5. Rnd 9: Ch 1, sc, 2 dc, 6 tr, 2 dc, sc, in each ch sp around, join. Fasten off. Hot glue to center of lid, and hot glue yellow silk flower to center of flower. Note: Originally, this project was intended as a candle holder, but a reader emailed asking if mixing yarn and fire was really such a good idea. I decided the reader was right. If you have crocheted this pattern as a candle holder cover, I would remove the cover when lighting the candle and use it only as a decoration when the candle is stored or unlit.